The remembrance Sunday gathering on the summit of Great Gable had just concluded and the 500 plus fell goers and climbers were descending their various descent routes. Cloud was down to Styhead Pass and it was raining, very windy and cold (5 degrees on the summit). A 59 year-old male walker from Lancashire accompanied by his wife had attended the gathering, descended from Gable and were just climbing up Green Gable when he collapsed and lost consciousness. 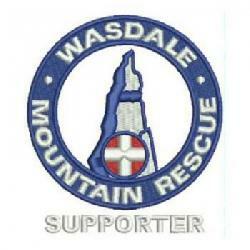 Three walkers close by administered immediate first aid and summoned help.A Keswick MRT team member was in close proximity and called on the radio “any Wasdale MRT member on Gable?”Approximately ten Wasdale MRT members had been at the 11 o’clock gathering and were therefore close to the casualty site. Within 5 minutes the first Wasdale team member was on scene to assist followed quickly by a second who had a large bivvy tent, the remainder of the Wasdale members followed in quick succession. The stretcher and casualty bag from the Styhead stretcher box had been collected by three of the Wasdale MRT personnel who had already descended to Styhead.Within a short period of time the casualty was revived and although still very unwell able to talk. A medivac helicopter was requested along with a call out of the full Keswick MRT. The helicopter from Great North Air Ambulance landed at Styhead Pass (cloud base) after ferrying Keswick team members up from the valley bottom. 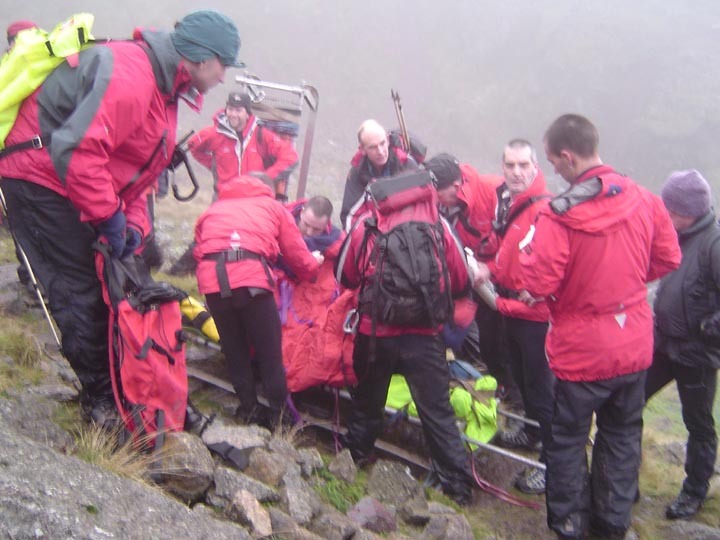 The joint teams sledged and carried the casualty down the Arron Slack gulley. The casualty was put on board the helicopter and was airlifted to Carlisle. The incident was closed down by mid afternoon. At the time of writing this report his condition is unknown. [now understood to have been a heart attack]. The Great North Air Ambulance press release is included below.